Mitochondrial disorders are a multitude of thus far incurable diseases, characterised by energy metabolism defects in the cell. Mitochondria produce energy by converting food components such as fats and sugars into cellular energy in the form of ATP. The final pathway of this process is called oxidative phosphorylation (Oxphos). A set of protein complexes simply named Oxphos Complex I through V carry out the last steps of the energy production process. Complex I, also called the Goliath, is a crucial protein complex in the process of ATP production. 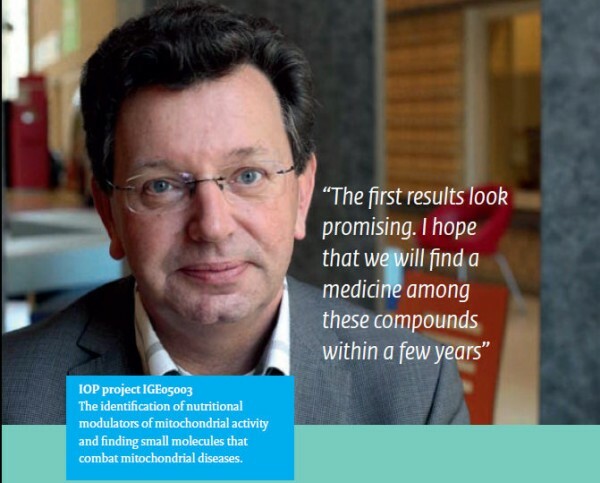 Project leader Professor Jan Smeitink at the Radboud University Nijmegen Medical Centre is a paediatrician specialised in inborn errors of metabolism. He focuses on Complex I to investigate the influence of e.g. potential drugs or nutraceuticals on the energy metabolism of cells. "Malfunction of Complex I may lead to several biological consequences in the cell such as reduced production of ATP or increased production of oxygen radicals or an altered calcium homeostasis. When we find a compound that modulates the consequences of Complex I malfunction, we have found a potential drug applicable for different mitochondrial diseases." The aim of the project has been the development of parameters (so called read-outs) that indicate errors in the energy production of the cell. For measuring these parameters, a unique screening platform with live cell lines was set up. Using live cells from patients presents a difficulty: sick cells grow more slowly while their attributes must not change over many generations. "I am proud that we succeeded in setting up our large library of well-characterised human cell lines," says Smeitink. About twenty new read-outs have been developed for the screening platform. These include oxygen consumption, oxygen radical production, cell morphology, pH, membrane potential, calcium levels and ATP production. Using a range of state-of-the-art imaging techniques, the selected cells can now be studied. The read-out technology has recently been improved by the development of methods to measure many parameters simultaneously. "This not only saves time but improves reliability by keeping conditions in the cell comparable between measurements." The optimised read-out technology created the possibility of high-throughput screening. "We will soon be able to screen hundreds of compounds." Three classes of compounds have proven to be of special interest for further investigation as candidate drugs. These are now being tested in animal models, according to Smeitink. "The first results look promising. I hope that we will find a medicine among these compounds within a few years." On the other hand, some medicines such as NRTIs used against HIV, some cancer medicines and anti-epileptics have been found to show mitochondrial toxicity. "Therefore lead compounds for drugs are also tested for mitochondrial toxicity. This is very important for large pharmaceutical companies. Time and costs can be saved by measuring effectivity and toxicity before the clinical trial is started." Besides using it for finding potential medicines, the new high-throughput technique is used to test "It is becoming increasingly important for the food industry to validate their claims on health benefits. But it is equally important that compounds were found that do not have any effect on the cell's metabolism at all, even though such effect was claimed in the literature," Smeitink explains. The consortium in Nijmegen is very well organised according to Smeitink. "We have a complete network of fundamental research, patient care, diagnostics and a commercial branch so that we can easily switch between the various stages of the process. This creates opportunities for the future in terms of follow-up research for finding a cure for mitochondrial disorders." One example is the Centre for Systems Biology and Bioenergetics, an initiative set up for continuing research in the field of mitochondrial diseases. In 2010 the centre received an NWO grant of 4.5M - for a five-year programme. Organised into three work packages, the research focuses on bioinformatics, mitochondrial function and model systems; researchers work on modelling mitochondrial energy metabolism in the context of human disease. These models will be used to predict the effects of mitochondrial disorders and compounds developed to intervene in the energy metabolism in the cell. "Our read-out technology, cell panels and cell lines form a firm basis for continuing the research," Smeitink says. Furthermore, the IOP project has resulted in the spin-off company Khondrion. The company will earn revenue by performing contract research for pharmaceutical and food industries by testing compounds with the screening platform. "The profits will be employed for research and development of the screening platform and lead compound development." Overall, Smeitink stresses the agreeable cooperation with the IOP committee. He has just one critical remark regarding the collaboration with some of the industrial partners. "Public-private partnerships such as those within the IOP Genomics project can be very beneficial. We enjoyed working with the smaller businesses, which was very fruitful. Collaboration with the larger companies was difficult at times. I think that a commitment to participate actively must be included in the agreement." "September 30, 2010 was a historic day for me," says Jan Smeitink. After years of lobbying, he was able to sign the contract for his spin-off company Khondrion (from the Greek for granule or small particle). In 2010, Khondrion won a Pre-Seed grant of 250 K euro from the Netherlands Genomics Initiative. The company will mobilise its unique knowledge, tools and skills to cure mitochondrial diseases. "This focus has paid off already," Smeitink says. "We are being asked to be a partner in publicprivate partnerships. It means we have become known in the European scientific world." The activities of the start-up company are twofold: the research department is focused on the primary goal of contributing to the development of a cure for mitochondrial diseases. The technology platform developed in the IOP Genomics project will be expanded, optimised and patented. The number and quality of the compounds influencing the energy metabolism in the cell will be expanded. Effective compounds will be patented. The services department has yet to start up. It will provide compound testing using the screening platform and the fully characterised cell lines for target discovery, lead optimisation, in vitro toxicology and compound profiling. "Regarding customers, we focus on pharmaceutical and food industries such as FrieslandCampina and NIZO food research as well as chemical companies such as Chiralix and Mercachem. We have contacts with various large companies for testing compounds. Some of these companies are also interested in joining us in cooperation for grants." Khondrion is now run by three people but is looking to expand, says Smeitink. "We want to expand to a staff of seven. Moreover, we are looking for a new CEO who is willing and able to take this company forward." · Analysis of mitochondrial respiration (oxygen radicals) using a highthrougput assay.